The Minister of State for Petroleum Resources, Ibe Kachikwu, believes a cordial relationship between oil producing companies and host communities will guarantee safe pipelines. "Oil companies must recognise that the only way they can have peace is to ensure that the community participates in the things that they do within those localities. "Oil Companies must hire people form their host communities to protect their pipelines because they know the terrain better". This is according to the Minister of State for Petroleum, Ibe Kachikwu. Nigeria's economy runs on crude oil and cases of pipeline vandalism spell instant doom and a return to recession. Recently, a militant group issued threats that it would resume attack on oil facilities, a decision which may need that the government establish a special pipeline monitoring team. But the Federal Government is pushing aside speculations that it awarded contracts for crude oil pipeline protection and was also training thousands of youth in the creeks of the Niger Delta. The widespread speculation had led to uneasy calm in the creeks, as youth in oil producing communities have continued to mount pressure on the Federal Government to involve them in the training. 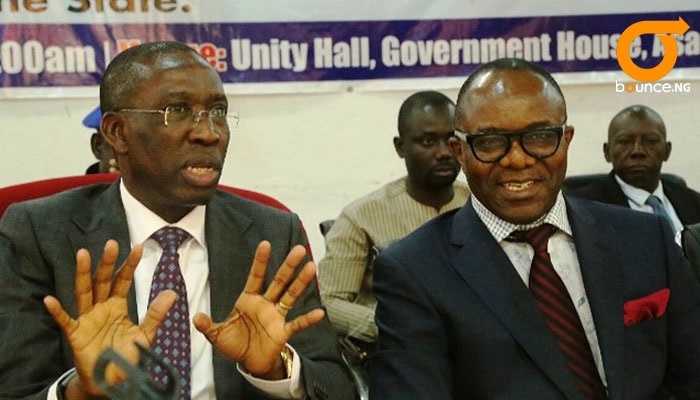 On Wednesday, Kachikwu denied the award of any contract while speaking at a forum in Asaba. He said Oil Companies must ensure community participation in the protection of pipelines. Dr. Kachikwu advocated for State to State pipeline protection policies that would empower the people and give them a sense of belonging. He said the government was doing a lot in ensuring that work commences next year in resuscitating the Warri Refinery, which is one of the biggest in the country to bring it to full capacity. He says on completion, the refinery is expected to produce 100 to 150 thousand barrels per day. Delta State Governor, Ifeanyi Okowa, who was also at the meeting said a sincere and open engagement process between the Government, Oil Companies and Oil Producing Communities would build trust and consolidate the peace in the Niger Delta region. “Investors who are interested in setting up modular refineries must technically and financially prepare,” he stressed. He also appealed for patience from Deltans in ensuring the smooth take off of the National Maritime University in Okerenkoko. Bounce News correspondent in Delta State, John Debia, reports that the engagement meeting was aimed at creating awareness on some key government policies as it affects the Niger Delta region. Areas that were looked at are modular refineries initiatives and gas flare commercialisation projects.